It’s common sense to be feeding your pet the most nutritious and healthy dog food you can afford. Most caring pet owners strive to give real quality dog healthy food that contains the proper nutrition and the important health support for their pets, this ensures an immune system running strong, while supplying nutrients for proper growth, health functions, and also to help prevent disease. But there is a disturbing trend today going on with dog health food today, and many world-famous doctors of veterinarian medicine, and published pet care experts, universally agree that any dog who eats just a commercial dog food is at a much higher risk of a premature death of some kind, and it’s often late to prevent a horrible death, mostly by a lethal injection. Even if you notice symptoms, many times it’s still too late. Your reward for giving your pet the right healthy dog food and nutrition, is a a strong and nutritionally healthy, and very happy dog, that grows gracefully old with you – healthy longevity for your pet! Beginning today, you can make simple changes in the way you feed your dog , and avoid the alarmingly high risk of the many the many diseases our pet’s are suffering with today. There are many problems that are starting to come out about the toxic ingredients, and lack of nutrients being found in commercial dog health food – and you cannot trust this as being a nutritious or beneficial source of goodness for your pet. And you must boost your pet’s food with the proper nutrients and support to provide the adequate cellular nutrition for maintaining a strong immune system – especially when you understand the toxic and free radical assault our pets are constantly under. Have you had a pet die of cancer, or some other devastating disease, if not, you probably know several people that have. Is it normal for our pet’s to be dying of cancer and other diseases? In the past it was far from normal, but today it is normal. But it is certainly not natural. There is recent scientific evidence in a study called “Theories of Aging”, that proves the potential lifespan of your dog is 27 years. When is the last time you’ve heard of a dog living that long? Detoxapet™ healthy dog food helps both dogs and cats thrive in today’s toxic environment by addressing the cause of your pet’s health problems, while also giving proper nutritional, immune, intestinal support. The balancing of the intestinal flora is facilitated, the immune status of the gut becomes stabilized, it also really supports digestion and proper bowel movements. Fact is, 90% of all toxins, bacteria, viruses and fungi enter the body through the gut, it only makes sense that we should concentrate our efforts on this organ system. Prevent huge vet bills! 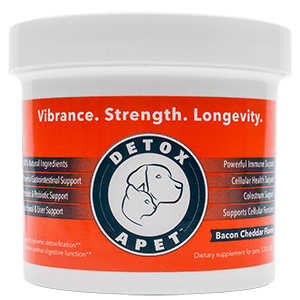 Powerful immune function support for a vibrant pet. Detoxapet for health dog food supports healthy digestive system working strong keeping a healthy level of a good bacteria with a high quality probiotic and colostrum – keeping the immune system running strong. With a range of ingredients to strengthen and support the gastrointestinal and immune systems for restoration. It also contains a variety of antioxidant-rich plant extracts supporting detoxification enzyme activity in the liver and other organs – with ingredients like Vitamin C, Glutathione and Alpha Lipoic Acid. It also contains special ingredients like High Quality Probiotics, Colostrum, Spirulina and High ORAC Fruit Powder. As a good pet owner, probably at some point you must have searched for the best health support for your pet, so you understand that it’s difficult to find the perfect health product for your companion pet. We recognize this, which is why we’ve introduced Detoxapet – the perfect health product for today’s pet. Our pet’s today live a lifestyle which contributes to a sluggish metabolism and are unable to remove toxins or eliminate unwanted fat from their bodies. The health of your pet’s intestinal bacteria is essential in maintaining a strong immune system. These protective healthy microbes can be depleted by today’s by diet and toxicity, causing imbalances in the gut, weakening the immune system and making the body susceptible. Detoxapet supports healthy digestive system keeping a healthy level of a good bacteria with a high quality probiotic and colostrum.